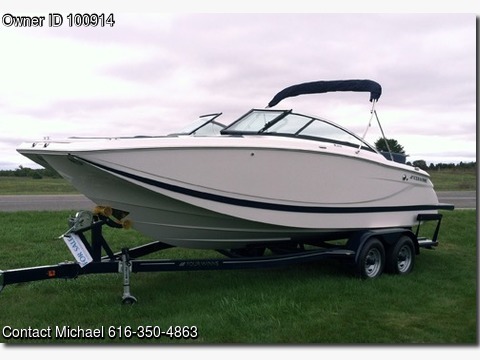 Boat is located in Zeeland,MI..Please contact the owner @ 616-350-4863...Here is a beautiful freshwater 2013 Four Winns SL242. She is like new! -It has 25 hrs at this time. -Added a snap-on bow cover that came with the boat. - The 320 HP Volvo Penta DP and a counter rotating prop. configuration that will keep you underway. -She is quiet and has loads of power. -She comes with a bimini cover and full mooring cover, seating for 12, and a pump out head which makes it nice for overnight stays. The huge back pad for swimming, rear facing seat that pulls out to a sun deck make the day time fun safe and inviting. When you come home the docking lights help keep it safe for the ladders on back and front. It's always nice to know about Mother Nature the water/air temp gauge, dual batteries with remote switch help keep it safe. Don't get lost in the huge storage locker below floor for skies, ropes, wake-boards, etc...., full warranty from date of sellers purchase.. Matching Four Winns dual axle trailer. Added a snap on bow cover that did not come with the boat. Paid for a spare tire and mount for the trailer Trailer is set up for disc brakes Full factory warranty from June 2015. Rear shower with 15 gal water tank. Booming stereo with rear controls.